In late 1263 the Norwegian king, Haakon Haakonarsson, and his storm-damaged fleet limped into the sheltered waters of the Orkney Islands: the old man was ailing, and with him the dreams of a Viking empire. Earlier in the year Haakon had left Norway and crossed the ocean to stamp his authority over the Hebridean Islands, west of Scotland; which had been assailed and claimed by the Scottish king, Alexander III in 1262. For decades, the Scots had tried to buy the islands from the Norwegians, and time and again Haakon refused – he and Norway were at the height of their power, and he was determined to maintain it. Frustrated, and with his own lofty ambitions, Alexander seized the islands, forcing a response. Eventually, the two forces met off the coast of Largs on the Clyde. The battle was inconclusive, but being so far from home and with winter approaching Haakon decided to take his fleet north to Orkney and launch another campaign the following spring. En-route his ships were smashed by Atlantic gales and ferocious seas; and both he and his fleet arrived broken into Kirkwall. On the 16th of December he died. His only surviving son became king; but unlike his warrior father Magnus VI was a peacemaker, and he decided to enter into talks with Alexander over the future of the islands. The protracted negotiations resulted in the Treaty of Perth in 1266, whereby Norway recognised Scottish authority and sovereignty over the Hebrides and Scotland acknowledged Norse sovereignty over the Northern Isles. Scotland was also obliged to pay an annual fee to Norway to compensate their loss. With the signing of the treaty, the once great Viking world of the Atlantic was reduced to the Orkney and Shetland Islands. Here the strongest affinity lay, and they remained a truly valuable asset. Shetland actually lies closer to Norway than Scotland, and Orkney had long been a pivotal crossroads between the Atlantic and the North Sea; so it is no surprise that these island groups were captured by the Vikings early in their expansion southwards. It is not clear whether the Norse, who first came as raiders and then as settlers, wiped out the local population, assimilated with them or a combination of both – evidence points to all three depending on the island. 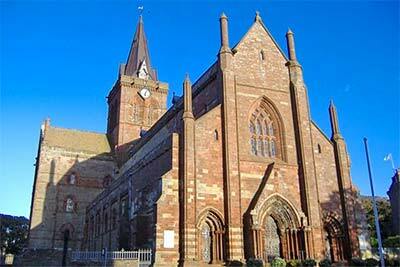 Orkney quickly grew to a position of power in the new Viking world, controlled by fierce warlords. In the late 9th Century, and probably in response to attacks against the homeland, the Norwegian kings extended direct rule, and established an earldom loyal and subject to their own Crown. That was the theory anyway; very often however they were a law unto themselves, requiring chastisement from their distant masters. Like the kings of Dublin and Mann, the earls of Orkney were powerful Norse rulers of what was effectively a sea kingdom, with their authority often extended deep into mainland Scotland as well. At one point both Caithness and Sutherland as far as the River Oykel came under their jurisdiction. But, these halcyon days were long gone as the ink dried on the Treaty of Perth. The first Earl was Rognvald Eysteinsson who died around 890; and from there a series of dynasties ruled until 1231, when Earl Jon Haraldsson was killed. Shetland was ceded from the earldom in 1194 and brought under direct royal control following the Battle of Florvåg; and by 1200 the earls held their lands in Caithness from the Scottish Crown directly. The winds of change were blowing through the north, and in 1236 Haakon bestowed the earldom on Magnus, Earl of Angus – a Scot. The Scottish Earls of Orkney still held their lands as vassals of the Norwegian crown; but there is no doubt that influence was shifting to the south. Many Scots now began to settle in the islands, and held important clerical positions within the governance of the earldom; the bishops of the mighty St Magnus Cathedral also came from the south and with them came a taste of feudalism. In 1379 this relationship and the centralising of power was cemented when the Sinclair family took office under Earl Henry, Baron of Roslin. The Sinclairs were textbook feudal lords on the make – they originated in France, came to England with William the Conqueror and made their way to Scotland by the end of the 11th century, where they carved out some territorial holdings. William Sinclair led the Scottish army against Haakon’s forces at Largs, and a grateful king gifted him the rich lands of Roslin near Edinburgh as a prize. Now the spectre of the Sinclairs rose once more, and held claim to the last bastion of Norse rule: Orkney itself. A year following the accession of Henry Sinclair as earl, Norway and Denmark entered a personal union under one crown. Known as the Kalmar Union, influence was weighted heavily towards Denmark, and Norway along with its possessions came effectively under the rule of the Danish kings. In 1468 the Scottish king, James III married Margaret of Denmark, daughter of Christian I. As part of the marriage agreement, the Danish king handed Orkney and Shetland over to James as a goodwill gesture in lieu of the usual and expected dowry payment. The dowry was never paid, so in 1470 the last earl holding the title from Norway, William Sinclair handed over control to the Scottish Crown. A year later James granted him lands in Caithness and raised him to Earl of Caithness (which the Sinclairs still hold) as compensation: it was a done deal. In 1472 the Danes formally agreed that Shetland and the Earldom of Orkney were forever ceded and part of the realm and crown of Scotland. And thus, a simple marriage debt secured the last piece of the Norse jigsaw – a land held by Norse warlords for over 500 years: where kings, earls, princes and priests had fought and died for control of the north. Never had a land been more fiercely held, and given away so cheaply in the end. Although formal Norse rule in Scotland ended in 1472, the influence of the Vikings, their language and culture has endured here in the Northern Isles, and to a certain extent in the Hebrides as well. 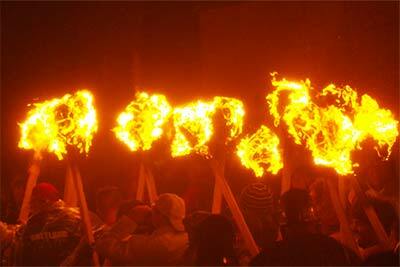 600 years of rule left an indelible mark: from the celebrations of Up Helly Aa on Shetland to the tiny remnants of Udal Law still contained in landownership; from the Scandic Cross on the flags, to Nordic place names and a dialect that just about retains a hint, a flavour of Norn – a language spoken until about 1850 (similar to modern Icelandic). 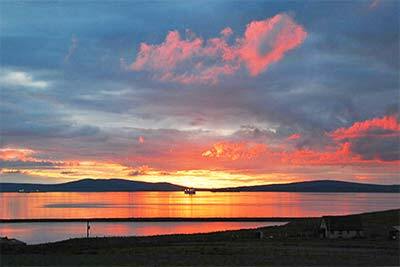 Orkney and Shetland are caught between two worlds: at once, both Scandinavian and Scottish. Here the legacy of the Vikings isn’t carved on ancient tombs, or remembered in crumbling, dusty chronicles; no, here in the long shadows of the north it lives on with a vibrancy in the people of these unique islands.